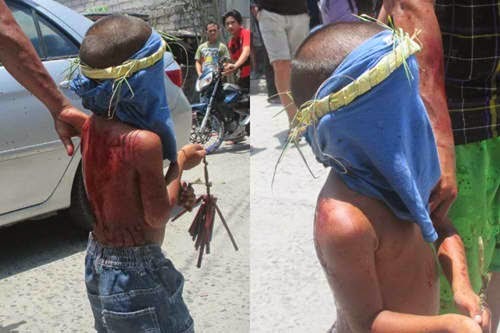 Netizens got shocked when they saw or watched the video about the 4 year old boy who joined the Holy Week or the most anticipated Good Friday Lenten Presentation of the Passion of the Christ in Cutod, San Pedro, Pampanga. The identity or name of the 4 year old boy was not revealed. You can see on the video or photo of the said 4 year old boy doing the "Pinetinsya" just like the adult ones. Those who were able to watched the video got worried because it's unusual to see a little boy doing the Penitensya. Here's a screen shot from the Video of the 4 year old boy Penitensya in Pampanga.